Sports history was made Saturday night when Bernard “The Executioner” Hopkins (52-5-2, 32 KO’s), at 46 years old, defeated 28-year-old former WBC and Ring Magazine Light Heavyweight World Champion Jean Pascal (26-2-1, 16 KO’s), making Hopkins the oldest fighter in boxing history to win a significant world title. Not only did Hopkins take the belts from Pascal in front of 17,560 fans in his hometown of Montreal (an indoor boxing event record in Canada), but he defeated father time once again and solidified his place as one of the greatest athletes ever to compete over the age of 40. With his unanimous decision victory, Hopkins became boxing’s oldest world champion, breaking George Foreman’s record, which was set 16 and half years ago. Foreman, who was 45 when he knocked out Michael Moorer for the heavyweight title on November 5, 1994, was 192 days younger than Hopkins when he captured his title. Hopkins displayed his excellent conditioning and ring fortitude throughout the bout and hammered the point home at the beginning of the seventh round, when while waiting for Pascal to leave his corner, Hopkins dropped to the canvas and started doing push-ups (click HERE to see push-up highlights). According to the scorecards, that round went to Hopkins too. It was a great night of boxing with a spectacular performance by the ageless wonder Bernard Hopkins. “[Beating the record] feels great. I did exactly what I wanted to do, which was break this record. I knew it was going to be a tough fight, but I wasn’t going to be denied. You don’t get a chance to do this too often. You are supposed to win titles when you are younger…in your twenties, not when you’re 46. “I didn’t feel 46 tonight. I felt more like 36. “I can say I am a great fighter. It was exciting. I think everybody enjoyed themselves. “I have been accused of being boring, but I saved the best for last. I am going to fight like this [with a more exciting style] as long as I am boxing. I believe I am an entertainer. When you are in your last performances, you give it all you’ve got. “I want to box as well as I can, and I think there are still great fights to come before I leave this game. “I always fight with my heart, but I had to be careful too. I knew this guy was dangerous. He punched hard, but I knew I had to be strong too. Like I said before, I saved the best for last and gave you a blockbuster performance. “I am going to keep fighting like this until I leave this game and trust me, when I leave, I will not be punch drunk, beat up or broke. “Be happy I am still here because one thing we can say is that I am not wasting anybody’s time. I went in there with a guy who that is young enough to be my son. “I don’t see anyone beating this strong bull from Canada. Coming from a veteran, he shouldn’t load up on his punches. He needs to take advice from this legend and not throw his punches so strongly. “He is a tough kid and he hit me with some good shots, but I am in tremendous shape. “I think Canada will welcome me back to fight [Lucian] Bute. I want either Bute or [Chad] Dawson. “This is in the top two moments of my career, right there alongside beating Felix Trinidad and the relevance of that. “I showed him a little bit of Hearns, Wolcott and Ray Robinson, but mostly, I showed him me. “Thanks to Golden Boy for getting this fight together after the first fight. We had to deal with a couple of things that worked out for everybody, especially the fans which is very important. “I would like to thank everybody in Canada that gave me the respect. I hope it was what everyone wanted. “He [Pascal] is a quality and respectful champion. He will be one of the ones that will stay around for a long time if uses this education that he experienced tonight. “If I want to box until I am 50, I will as long as I come out unscathed. I will fight as long as I am hungry. “If I don’t win, this is over for me. I know there is no tomorrow. If I want to still box, I don’t want to embarrass myself. I understand the stats are against me. I had to put myself in a situation where I had to be near perfect. “I want to thank everyone for enjoying history. “I talked to George Foreman on the phone. He said he might come out of retirement to break my record [laughs]. “I was on the edge of my seat every round. It was such an exciting fight. 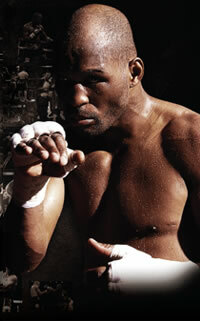 Bernard was the better athlete, the smarter fighter and was in the better condition. Now that a 46 [year-old] has done it, next a 47[year-old], a 48[year-old], a 49[year-old] and a 50 [year-old] will do it, and if somebody does it at 60, then I’ll have to get back in there. “Look, Hopkins did push-ups. What great conditioning, and he did it in Pascal hometown. Isn’t that something? He was just so much better. I’m happy for Hopkins and I’m happy for mature athletes.